If you’re a creative freelancer or consultant, you’re probably not thinking Business Mastery events apply to you. They might seem targeted at other kinds of businesses or people, or that you’d need an MBA to fit in. I totally get where you’re coming from… but I’m here to tell you you’re missing out! Many freelancers struggle because they fail to think of themselves as business people, and instead treat their business like a hobby or a constant job search. Below are some of my top takeaways from Tony Robbin’s Business Mastery, but with most of the big business talk (like “Income Statement” and “Revenue Projections”) translated into laymen’s terms for my creative peeps. Let me know what you think and what else you’d like to know in the comments! Fall in love with your clients, not your products or services. This is huge. Most companies focus on the things that they offer, what they do, their key value/differentiators. What is actually important is who your client is, what will keep them happy, how to get them to come back. A lot of consultants or freelancers fail at this. We wait a long time to separate our business and personal expenses, and rarely have bookkeepers. As we grow – especially if we want to do sustainably – we must look at our finances. This means two sets of books (one for the IRS and one for the actual business) and a lot of attention to detail. Your personal books should clearly separate out any “tax deduction” purchases (like that new camera) that weren’t absolutely critical to business operations – this way, you know how healthy your business actually is. The most important part of your business is creating a raving fanbase. You want customers who will tell their friends, put you on social media, and spread the word about how awesome it is to work with you. This will keep you sustainable and growing, which is important in a world that faces recessions every 8-10 years! This kind of reliable and excited set of customers will help you weather any winter. And it’s just fun! You’re happy when you are making them happy. Always add more value for your client. Whether that’s creating packages that serve their needs or creating tailored programs, or surprising and delighting, it means serving them to your absolute best ability and going above and beyond. Make sure you’re doing more more than what your competitors will do. Offer yourself in the service of whatever it is they need, give your best content away for free! This is what will create the raving fan culture. You must have a second biz, especially if you’re a small freelancer or consultant. You want to stop trading time for money. If you’re starting off as a freelance designer or writer, you’re trading your time for your money, and that’s okay! Eventually, you will want to create packages based on value, instead of time. As you do this – and incorporate alternate sources of income – you’ll become an operator with more time and income on your hands. Master the funnel and keep it narrow. Often, people decide to start a business – especially freelancers and creatives – by going after any client they can get. That’s totally understandable, but it’s not the best way to go about building your business. Instead, you want to really focus on one client type or industry. You’ll be able to speak to that person’s needs better when you’re focused. That will mean you produce better work and keep clients happier! Make business a spiritual game. Manage your personal state carefully. As entrepreneurs, we often struggle to take good care of ourselves. We might focus really hard on projects ahead of us, skip lunch, and put work ahead of well-being. We might also neglect to think about the ways we work best for various tasks. Maybe we write best from home, but design best from cafes. Paying attention to ourselves, our energy, and our needs is critical to producing good work! Any good business does this, but creatives and self-employed often forget. If you’re not measuring and you don’t know what’s working (or not), everything you do is a blind guess. Make sure to look at your analytics (like social media metrics, email open rates, and Google Analytics) to see what works well, what doesn’t and adjust your programs accordingly. Bottom line? Tony Robbins Business Mastery was an amazing experience for me – not just from an information and learning standpoint, but also from a networking standpoint. I made a dozen or so incredible friends and business connections, had a ton of fun and got completely re-energized in my business. I was able to see where I was playing small and where I really needed to spend time to get my business to where I want it. 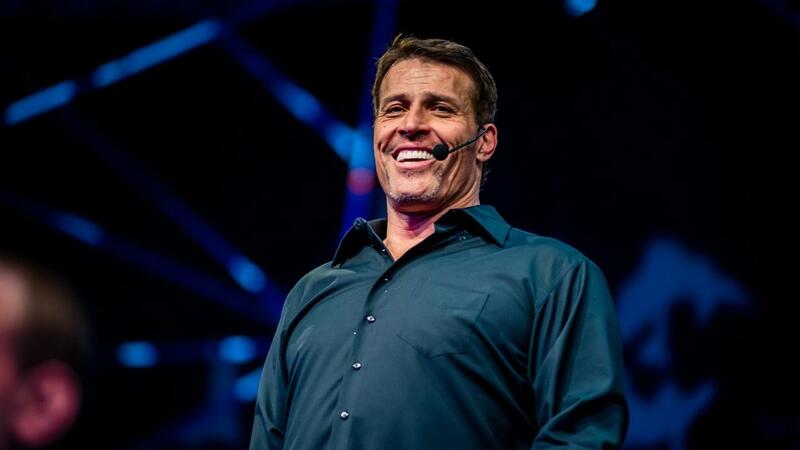 Have you ever thought about attending a Tony Robbins live event? If we’re connected on social media, you know how much these events have changed my life and that I cannot recommend these events enough. Within a year of attending Unleash the Power Within, I’m down 3 dress sizes, wake up everyday with energy and have managed to travel to 14 countries while building my business. I honestly don’t think I would have had the success I’ve had this year if I hadn’t gotten the jumpstart I got at UPW… and I know I’m just starting to reap the benefits of Business Mastery and Date with Destiny. If you’ve ever considered it, just do it – you will not regret it. You can find tickets to his next event at TonyRobbins.com.